QUESTION ONE: WHO’S PADDLING THIS BOARD? If you’re the only person who’ll be using your board, lucky you! You can choose a board that is a 100% perfect fit for your size, shape, ability level and what you want to do with it. If you’re planning to share the board among family members, you’re best to consider the height and weight of the biggest person using it, and also the size of the person who will use it the most. Usually, you’ll want to find a middle ground, leaning more towards the main user. QUESTION TWO: WHAT IS THE RIDER’S WEIGHT AND HEIGHT? Starboard provides a “RECOMMENDED RIDER WEIGHT” for every board that allows you to find all suitable boards for riders of all weights, from Under 40kg to Over 100kg. It’s important to pick a board with the right weight capacity so you will be stable and the board will perform how it’s meant to. The only thing worse than a board too small or narrow, that means you’re always falling in, is a board that is too big and hard to control in the wind. QUESTION THREE: WHAT IS THE RIDER’S ABILITY LEVEL? But let’s not assume that all first-time board buyers are new to stand up paddling! You may be doing a PaddleFit program, have hired a board, or mucked around on a friend’s board before. Contact your local Distributors and ask about their next Starboard demo day, or maybe sign up for a class or two. Learning new skills and good technique will improve your paddling ability faster, and you will end up buying a board that you won’t outgrow as you get better. Usually, when you start out in paddling, you want an ALL ROUND / CRUISING style board that lets you try a bit of everything. You can catch a wave on pretty much any Starboard board, so if you’re thinking you’d like to try a bit of surfing, you’d be sweet with anything in the ALL ROUND / CRUISING range, a BLEND or a WHOPPER. If you’re using it for fitness, racing, or maybe to do a little island hopping or exploring, you want to choose a longer board – something over 10’. The GO boards are ideal, really stable, beautiful glide, and of course, amazing artwork thanks to World #1 ranked female paddler Sonni Honscheid. If you’re just mucking around off the beach or boat, catching small waves, or you’re very small in stature, you could go down to around 9’0 and still paddle ok in flatwater. If you’re thinking mostly surfing, a little bit of tiki-touring or flatwater, you could consider a WIDE RIDE or a WIDEPOINT. If you’d like to get into downwind paddling, you’re going to want something 12’6 or 14’ and Over. 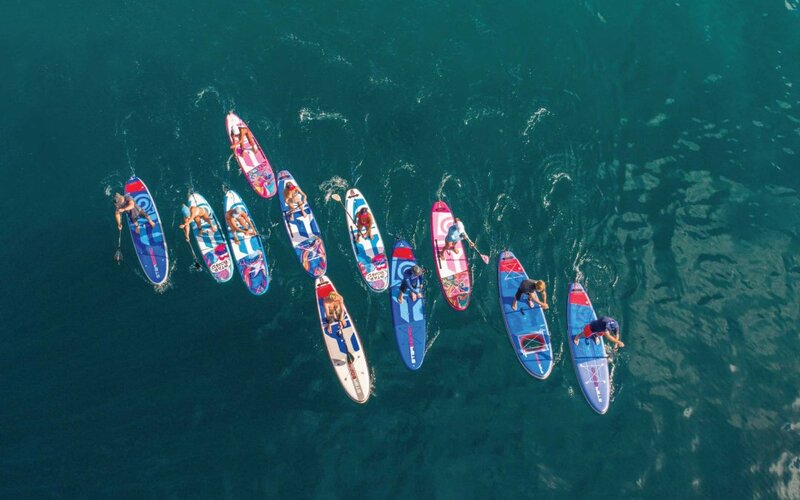 If you’re buying a board that you’re going to use 90% of the time on flatwater or small chop (about knee height), in a harbour, on a lake or on a river, you want to choose a nice long slender board. The Starboard TOURING range has a 14’, 12’6, and 11’6 options and several different widths to suit different rider weights. Or if you’re pretty stable and comfortable on a board, you might want to consider a wider race board. If you’re still in the beginner to intermediate zone, the GO boards are the perfect flatwater solution. If you’re using it mostly on a surf beach, then go for one of the BLEND range. These surf like longboard surfboards, and make it really easy for you to catch your first waves, as well as having a good amount of glide to cover longer distances. You guessed it. This is where we work out if you need an inflatable board or if you’re better with a hard board. If you have room to store it, a means to transport it, and you can lift it, then I’d recommend a hard board. If you want to travel with your board (such a cool way to experience the world! ), you live in an apartment or on a boat, or you don’t have a car, then an inflatable board in a magic travel bag, complete with roller wheels, backpack straps and a two-way pump (with room for your summer clothes), is the best option for you. The other reason you might choose inflatable is because they are generally lighter and easier to lift and carry. And if you’re using your board often, you can always leave it inflated and tie onto a car. The only downside to inflatables is that they don’t perform quite so well in choppy conditions and wind. So think about the location you usually paddle, and whether you’ll want to go out when it’s blowing 10-15knots. You can always choose a TOURING Double Chamber or AIRLINE Inflatable, they are designed to be more rigid, feel more like a hard board on the water, and are easier to paddle against the wind. Not all boards are created equal, but this is where technology comes in. All Starboard boards are built with the highest quality materials and designed to be as light as possible, but you’ll find there is still a big difference between a really large, high volume board designed for a 100kg+ paddler, and a smaller board for a lighter rider. Yes you could buy a cheap paddle board package online for under US$700. But we guarantee you’d get more enjoyment out of picking up an old secondhand Starboard than shelling out for a low-quality no-name brand board from the internet. If that’s still feeling too high, how about finding an old-season or ex-demo board? Starboard boards really do last for 30 years or more. They also hold their value well and are easy to resell if you decide to upgrade to a faster or more high performance board. Although we do find that most people keep their first board forever, and it becomes the board they introduce all their friends to SUP with. Starboard paddles are easy to work out. There are basically two different shapes – one for racing and flatwater, the other for all round paddling and surfing. If you’re NOT surfing, go for the LIMA. If you are catching waves sometimes or often, go for the ENDURO. If you’re the only one using it, buy a fixed shaft cut to your own size (about a Shaka above your head). If you’re sharing it with someone taller or shorter, buy a 2-Piece adjustable. If you’re traveling, buy a 3-Piece adjustable. Shafts come in round or oval. I prefer oval for racing because I can feel where the blade is in relation to my hand and board, so I don’t “slip” (imagine face-planting onto your board because your paddle accidentally went in sideways). But it is totally personal preference. So is stiffness, BUT you’re really not going to notice the difference when you’re starting out! If you have big hands, ask for the larger 27.5 shaft. If you have really small hands and you’re not very tall, you might enjoy a skinny shaft. As I mentioned before, go for the best quality you can afford. I would choose the Tufskin paddle for the boat or as a spare. As Starboard’s heaviest and lowest price point paddle, the Tufskin is still a lot lighter than most other paddles out there. Remember, the lighter your paddle is, the more you’ll want to use it, and the longer you’ll be able to stay on the water. 3. Moving Water / River Paddling: NO LEASH or QUICK RELEASE SPECIAL RIVER LEASH – you don’t want to get tangled /trapped and not able to get your leash off in the flow. I always recommend wearing a PFD when paddling, and in most countries, it is the law to wear or carry a PFD on a SUP – EXCEPT when you are surfing. You basically have two choices: a vest or a waistbelt. The Starboard Inflatable Waistbelt PFD when inflated is 150N of air. That’s enough to save your life in an emergency. Its also extremely comfortable to wear and you don’t even notice it when you’re paddling. QUESTION TEN: LAST BUT NOT LEAST…. DO YOU LOVE THE OCEAN? If you’d like some personalised guidance to buying a board from Starboard, don’t hesitate to contact your Local Distributors. Thank you, Victoria from Starboard New Zealand for this article.